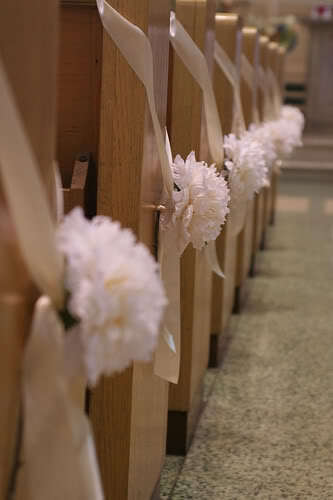 Pew bows are one of the easiest and most budget-friendly of ways to decorate a church venue, and can even take the place of flowers should you be so inclined. Either festton every single pew end with bows, every other pew, or add some flowers into the mix for a more sumptuous feel. There are many different ways of making pew bows, but on the whole they all need the same kind of ribbon. 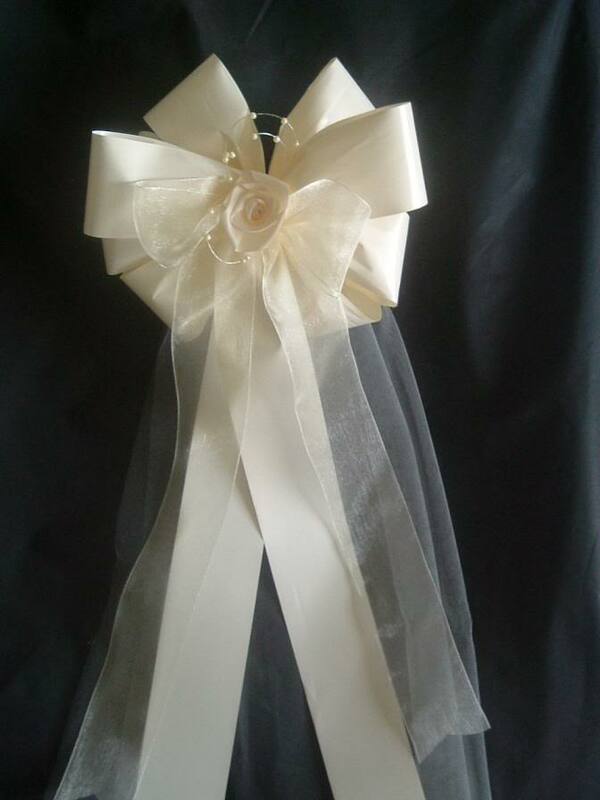 Just as when making big poofy bows for a wedding venue, your ribbon will look more full and stay in place longer, if you use a stiff fabric or ribbon for making pew bows. You could also utilize wire ribbon, or if your chosen fabric is pretty but not very stiff, use spray starch to make your bows stay in place. The ideal length of ribbon needed to make a pew bow depends on what look you are going for when decorating. As a start-off point, a ribbon width of 6-9 inches, measuring 2-3 yards in length is the norm; but it's worth spending some time playing around with your first bow to make sure you have the dimensions right, before cutting up multiple lengths of your chosen material. If you are going for a more modern, minimalist look to your pew bows then you can easily half these measurements, but the longer the measurement the more loops and fullness to your pew bows will be achieved. The easiest method for creating pew bows is by using the figure of eight, looping method. Hold one length of ribbon in your hand, at the midway point. Use your other hand to make a loop on one side, and pull it over for the other hand to hold in the center. Repeat this method for the other side, and hold securely. Take another length of ribbon, and wrap this a couple of times, around the middle of your loops. Tie at the back, and let the ends hang down to make tails. You can repeat the first step as many times as you need to, to make a more loopy bow; more traditional pew bows can have 12 or more loops. You can make several 4 loop bows, and attach these all together in the middle with a blob of glue, to make the process of a 12 loop bow easier. You can of course, just tie a straightforward bow around the pew ends, or make several of these and pile them on top of each other. 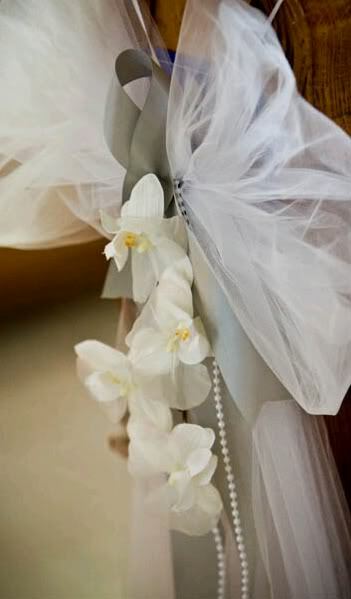 Or alter the angle you place them down each time, and attach together in the middle with a few stitches or a few winds of florist wire - you can always stick a small bow, or faux flower over the join. As it is obviously very important to leave the pew ends in the state you found them, consideration should be given to how you are going to attach the pew bows. As well as being ideal when decorating the church for a budget wedding, by far the easiest way to attach pew bows is to use one of the tails you have created when making them. Take two of the smallest ends and tie around the pew end, finishing with a bow on the reverse side. For a quick way to attach pew bows to pew ends, you can buy pew clips from some florists, or specialist wedding stores. These are plastic clips that clip over the top of the pew end; there are loops and clips on one side to clip in your ready-made pew bow, and some even have extra attachments for attaching balloons etc. Don't Leave Without Your Tips! To make your pew bows that little bit different, you could try incorporating strings of pearls, flowers, ivy, or a different colored ribbon in a narrower width. Making a pulled rose, to add to the center of a pew bow, is an easy undertaking. Glue the ends of a length of ribbon together, to make a ring shape, and use a running stitch along one of the edges. Pull both ends of the thread to bunch up the ribbon into a rosette. 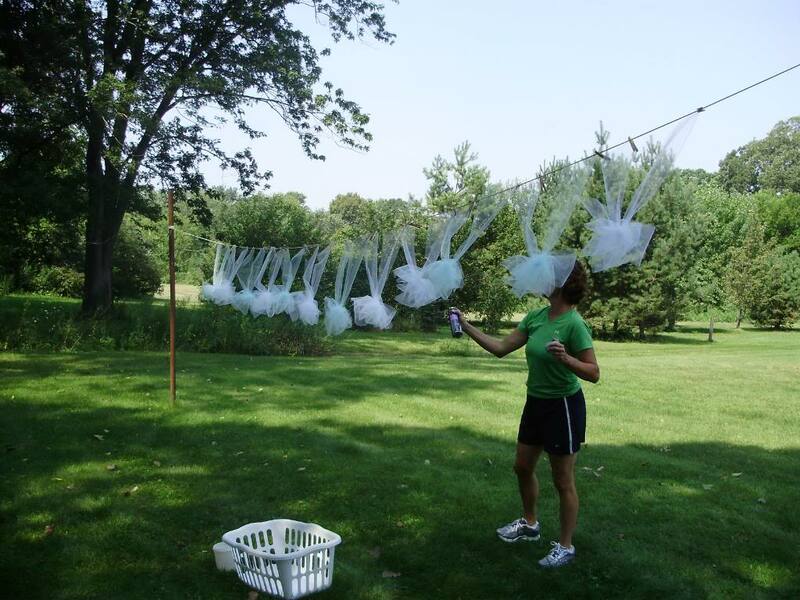 If you need a quick method in how to make pew bows in large numbers, use a washing line to help you. 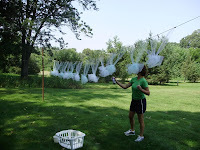 Not only is it easier to work at eye-level, you can utilize the pegs to keep the loops in place as you make more loops; after the bows are finished, spraying starch on them, to improve their poofy-look and staying power is made as easy as 1-2-3.